It's been two weeks since the 10k and now I was ready to drop down a bit further in distance and pick up the pace with my first 5k race since Feb 2015. This was going to be a flat fast course and I had hoped to be able to run sub 22 or at least get close to that but the weather had other ideas. With a late 9am start, plenty of sunshine, nearing 80F and with the moist air lingering with humidity near 100% it was not going to be conducive to fast running. With about 30 minutes until the start I did my usual warmup mile and was drenched. Drank some water and made my way to the starting area and did a few strides before lining up with 5 minutes to go. Right on time we were sent off and I quickly fell into a long comfortable stride. I felt fine as we headed down a wide flat straightaway for about 3/10ths and then made a u-turn onto the pedestrian bridge leading onto the greenway. It got a little congested here and already some of the less experienced runners were slowing down quite a bit so I spent the next half mile or so carefully making my way around and trying not to slip on the slick as snot boardwalk at the beginning of the greenway. I was pleased but not surprised to hit the 1 mile in 6:57 but it wasn't long after that I began to feel the effects of the humidity and the course moved back out into the sun. I just kept digging trying to hold pace as much as possible on what seemed to be a very long mile 2 . The distance was right by the race sign and my garmin but it was just my deteriorating pace that made it seem that way. I had hoped to be around 7:15 but it was a disappoiniting 7:32 and my hopes of sub 22 were dashed and some quick mental calculations told me unless I was able to hold pace it would be close to go under 23. 1/4 mile later and I was just hurting and it was so tempting to back off the effort but I just sucked it up and tried to hold on until about half mile to go and then I began to push it. By now I was making the death sounds scaring anyone around me. I actually expected mile 3 to be over 8mp but it was 7:42 and I still had a very long shot at breaking 23. I gave it all I could but come up short in 23:03 and instantly began dry heaving. Wow, these 5 k's hurt. But I recovered quickly and went to check the results before doing my cooldown. 29th overall out of 406 finishers and 2nd in the 60-64 age group. Not bad under these conditions and at this point in the training. I'm not sure when or where the next 5k may be but if I can get some better conditions sub 22 is happening ! So, what about the training the past two weeks? Well after the 10k two weeks ago I took a rest day and then just easy running the rest of the week other than a fun fartlek run on Thursday. Just 30 miles for the week along with 4 Bikram Hot yoga classes, 2 weight sessions, one body weight day and I did the 5 Tibetan Rites all 7 days ! 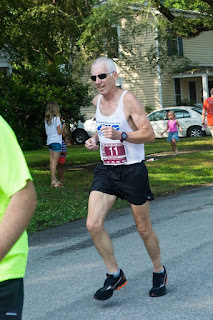 The next week leading up to the race was again mostly easy running and it seemed everyday I ran was muggy and miserable. On Wednesday I went to the track for my first real start of some speedwork. I didn't want to do much or too fast so I just did 6 x 400 at avg around 7:30 pace which turned out to be just a bit slower than my 5k race pace.With the race I kept the mileage low and ended up with just 28 miles. In addition there were 4 more Bikram classes, 1 weights session and I got in 5 days of the Tibetan Rites.